Its obvious to all, but the most myopic civil servants and Ministers, that at many points in its network Network Rail is running out of capacity. Those of us who actually travel by train will remember the bargain basement sale of railway land to property developers, particularly in urban areas, and may wonder whether these two phenomena are in some way connected. The concept of safeguarding railway land for future growth was until recently totally unknown in the Department for Transport and its predecessors. After all, the orthodox thinking was that they were managing a facility whose use was declining. Nowhere is the government’s (regardless of the actual political party in power) bias against railways more clear than when it comes to planning for the future. Whereas new roads are built in anticipation of future growth. Railway development occurs on an ad hoc basis in response to current congestion and grumbling commuters. Railway prices are maintained at the highest levels in Europe to deter the much faster growth growth which would otherwise occur. Birmingham is a classic case study. In the good old days, Birmingham had two main line stations, and two railway lines from London, which shared the load between them. Birmingham Snow Hill on the former Great Western Railway, received trains from London Paddington, via High Wycombe, Banbury, Princess Risborough and Leamington Spa and then forwarded them on via Wolverhampton Low Level, to Wellington, Shrewsbury; and then to Chester and Holyhead; or via Welshpool to Aberystwyth, or Pwllheli. Birmingham New Street received trains from London Euston, via Rugby and Coventry and then sent them on via Wolverhampton High Level, to many destinations further north served by the former LMS railway. Meanwhile there was a third North to South railway (the former Great Central main line) which had a connection to the GWR route from London at a point between Banbury and Leamington Spa. The two London-Birmingham-Wolverhampton railways worked splendidly together, particularly when things went wrong on one of the lines. The arrangement also helped to reduce overcrowding at peak hours, but it seemed terribly wasteful to the car-bound civil servants in London who determined that Birmingham did not need two principal railway stations. Snow Hill was closed at the end of the 1960s, its wonderful ‘winter garden’ glass roof demolished, and the site was turned into a car park. Subsequently, Snow Hill has been reopened as the eastern terminus of a Birmingham-Wolverhampton tramway, and the western terminus for the Chiltern Railways service running from London Marylebone, but it is only operating at a fraction of its previous capacity. Now Birmingham New Street is bursting at the seams and there has been some debate as to what to do. It doesn’t need an Einstein to open up a map of the city centre and to notice to that the former GWR and LMS main lines cross each other a little to the East of the City centre and that this is an area of derelict former railway and run down industrial land in need of development. There is plenty of room here for a much larger station with a much greater capacity for serving trains than at New Street. Such a new station could be served, both by the ‘bursting its seams’ line from Euston, and the line from Marylebone or Paddington, which still has surplus capacity. In the future the railway line from Birmingham Snow Hill to Wolverhampton Low Level could be restored, relieving the pressure still further. Now comes the stroke of genius! Much of the GWR line into Birmingham is four track or more – two fast tracks, two slow tracks and various goods loops and sidings. 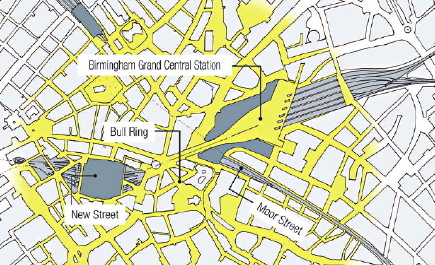 If HS2 is constructed, its ‘Birmingham branch’ will have to penetrate the Birmingham suburbs somehow. What better way, than alongside the old GWR route. Moreover, if HS2 is constructed along the route of the old Great Central main line, then this route actually had a branch which connected with the GWR line. So the new station would be in the right place and have the spare capacity to serve HS2’s Birmingham branch as well! 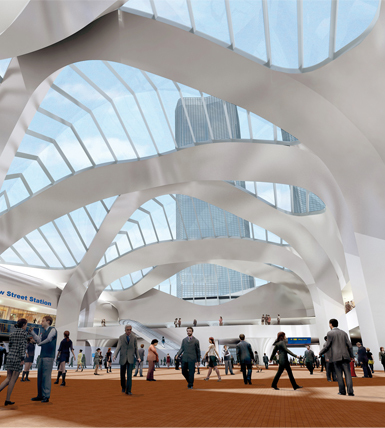 We would like to claim the credit for all this creative thinking, but although using the former GCR main line for HS2 has been one of our on-going campaigns, the proposals for a Grand Central station in Birmingham are the work of Arup. And how has the Department for Transport and Network Rail responded to Arup’s visionary proposal? Why, they’ve come up with a £ 600m plan of their own to redevelop New Street at its existing location which will not add a single train to the station’s existing capacity, but will have plenty more room for shops in the concourse. At least it will give frustrated passengers something better to do than milling round aimlessly in the concourse when waiting for their delayed trains. I suppose it’s no good thinking that Ruth Kelly’s successor might reconsider the decision? Our campaign, not to go ahead with the 3rd runway at Heathrow but instead to plug in the airport to a future British high speed railway network, has received a boost from Teresa Villiers, the Shadow Transport Secretary. She said rail could offer a viable alternative to short-haul flights and mean 66,000 fewer flights a year, about 44% of the planned capacity of the third runway. A Conservative Government would build a new high speed rail line between Leeds, Manchester, Birmingham and London, which would cut journey times between Birmingham and London to 40 minutes and between Leeds and London to less than an hour and a half. “It will leave a lasting legacy for the future – and it will lay the foundations for a high speed network that I believe will one day stretch across the country… We will target construction of the new high speed line to begin in 2015, with full completion by 2027. We will see if the plan is included in the Conservative Party Manifesto when the elections are held. Now who do you reckon will be in power in Britain in 2015? Corruption or incompetence? You decide. Whistleblowers punished, guilty go scot free. Let me declare my interest. I have a soft spot for old Balsall Heath, a run down area of solidly built victorian artisan housing in Birmingham which the City’s planners have largely demolished and replaced with anonymous multi storey flats. Unfortunately there’s ‘more jobs for the boys’ in demolition and wholesale redevelopment than in sensitive refurbishment. A developer has ripped up floors, undermined foundations and made unauthorised alterations to Balsall Heath’s Grade II-listed former tram depot, in Moseley. Planning officers knew what was happening but took no enforcement action. So two Moseley councillors, (Liberal Democrats) Martin Mullaney and Ernie Hendricks made a video which they posted YouTube highlighting the damage. Was the developer, Safdar Zaman, fined or otherwise punished? Not a bit of it! Instead planning officers drew up a plan which would allow the building’s conversion to offices to continue. Their plan was approved, following a heated debate at the Council’s Planning Committe, by seven votes to four. One of the four opposers, Coun Mike Sharpe (Lab, Tyburn) said: We shouldn’t let people do what they want to a building and get away with it. What’s the point of a planning committee making rules if developers just ignore them? His colleague Coun Keith Linnecor (Lab, Oscott) added: Where is the enforcement? He should be made to put it right, then come to us for planning permission. We might as well not give protection to historic buildings. And what of the two councillors who blew the whistle? They were hauled before the Council’s Standards Board and severely reprimanded. They were made to take the video down from You Tube. Councillor Hendricks has served a suspension, while Councillor Mullaney is awaiting the outcome of an appeal. It seems that the Standard’s Board is unaware that ‘social necessity’ has been used successfully as a defence to the charge of tresspass. In each case replace the “(at)” with the ampersand symbol. The unexpected announcement that Ruth Kelly was planning to leave Gordon Brown’s cabinet ‘at the next reshuffle’ – and its peculiar timing at 3 am on Wednesday morning – has left left UK political analysts reeling. But here at BTWT we are more concerned about the impact of Ruth’s departure on British transport policy than on its impact on the survival of Gordon Brown as Prime Minister. Kelly is one of the brainiest members of the cabinet, she has even been tipped by some to be a future prime minister. She sat her ‘O’ levels a year early, and then won a scholarship to Westminster School to take her A-levels. She went on to Queen’s College, Oxford where she read Philosophy, Politics and Economics. 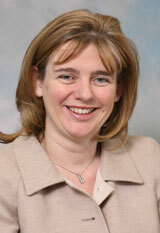 She graduated in 1989, and then gaining an MSc in Economics in 1992 at the London School of Economics. Her political career has been fast track. She joined the Labour Party in 1990. At the time she was an economics writer for The Guardian, and then in 1994 moved to the Bank of England. In the 1997 general election, Kelly gained the seat of Bolton West from the Conservatives. She gained her place in parliament as Tony Blair became Prime Minister with Labour’s landslide election victory. She served on the Treasury Select Committee. In 1998 she was appointed as Parliamentary Private Secretary to the Agriculture Minister, Nick Brown, at the Ministry for Agriculture, Fisheries and Food. Kelly was a member of a commission set up by the Institute for Public Policy Research into the Private Finance Initiative. After Labour won the 2001 general election, Kelly was appointed as Economic Secretary to the Treasury. Her role focused on competition policy and small businesses. After a year, she was promoted to be Financial Secretary to the Treasury, giving her responsibility for regulation of the financial services industry. In both positions her principal task was in the thorough revision of the Financial Services regulation system. Kelly was given the task of dealing with Equitable Life after the life insurance company ran out of money to meet its obligations to people who had bought it pension products. She was promoted to be Minister for the Cabinet Office on 9 September 2004, replacing Douglas Alexander. Kelly guided the Civil Contingencies Bill through its final stages in Parliament. In the reshuffle following the resignation of David Blunkett on 15 December 2004, Kelly entered the Cabinet (also becoming a member of the Privy Council) with the position of Secretary of State for Education and Skills. She became the youngest woman ever to sit in the Cabinet. After the English local elections in May 2006, Kelly was appointed Secretary of State for Communities and Local Government. She was also given the post of Minister for Women and Equality. Kelly was appointed Secretary of State for Transport in Gordon Brown’s new cabinet on 27 June 2007. Sadly in her last cabinet role Kelly’s strategic vision did not match her brainpower. Instead she proved herself ‘a safe pair of hands’ supporting the UK Treasury policy of clamping down on railway spending. She never quite ‘linked the dots’ as to rising fuel prices, the government’s green agenda, shifts to other modes of transport taking place in other European countries, and the renaissance in modern railway transport going on in the rest of the world. It was during Kelly’s watch at the DfT, that some bright civil servant coined the phrase ‘modally agnostic’ with respect to the Department for Transport’s transport policy. Kelly’s speech at the Transport Times conference ‘Action on Climate Change: A Role for Transport’ makes depressing reading. It is available in full on the DtF website. Here are some extracts. Considering the long-term growth in road transport predicted by Sir Rod Eddington, we will need to achieve an almost complete decarbonisation of cars by 2050. Eddington was commissioned to write a ‘steady as she goes’ report. Predictably, it said nothing about the modal shifts from car to public transport going on in the rest of the civilised world, nor did Kelly’s speech. Restricting air travel, for example, from Heathrow is going to have no impact on climate change if passengers just switch their flights to Paris, Frankfurt or Schiphol. Eddington’s analysis ignores the flight away from internal air transport in France in favour the HGV. Eddington – as an air industry insider – should have known about this, but he ignored it in his report and instead undermined the case for HS2 – a brand new high speed North-South railway up the spine of the UK. Kelly was also a steadfast supporter of the highly controversial third runway at Heathrow. In last year’s Rail White Paper we rightly prioritised investment for the next five years in a massive increase in carrying capacity so that our railways can continue to meet the huge demand that has made our railway the fastest growing in Europe. But looking beyond that I can see great potential for a rolling programme of electrification. So while the rest of the Europe constructs a third generation railway network, the DfT will only encourages Train Operating Companies to buy more railway carriages, and then 5 years later (when the Tories are firmly in control of Downing Street) there will be ‘great potential’ for some electrification. Hardly stirring stuff! Who will replace Kelly? Tom Harris the Undersecretary of State responsible for rail at the DfT would be a natural choice. But our crystal ball says Gordon will choose another woman. Will it be Caroline Flint, who has worked at Department for Trade and Industry, Foreign and Commonwealth Office, Department of Health, Department for work and Pensions and the Department for Housing and Planning, or Dawn Primarolo, an experienced Treasury hand? Watch this space. Gordon is unlikely to appoint anyone who might rock the boat. So don’t reckon on any U-turns regarding transport policy. And Ruth? Expect to see her back one day in a senior post – running the Home Office perhaps – in a future David Miliband government. Liverpool car 953 at Utting Avenue Railway Bridge, 30 July 1955. Photo ©David Clarke. The Liverpool Echo reports that delicate negotiations involving Merseytravel, the Treasury and the Department for Transport are close to completion regarding the construction of Line One, between Liverpool city centre and Kirkby. A detailed blueprint for the construction of Line One – costing many £ millions had already been drawn up when the then-transport secretary Alistair Darling, now the chancellor, pulled the plug on the scheme more than two years ago. Transport secretary Ruth Kelly has said that she will back the project, ‘provided the economic benefits to Merseyside are proved’ and government funding is kept to its original £180m ceiling. BR Standard 9F Class 2-10-0 locomotive 92220 Evening Star, built in 1960 in Swindon Works, the last steam locomotive to be constructed by British Railways, awaiting the ‘right away’ on the Keighly and Worth Valley Railway. Photo © Dave Cooper. Dyspozytor is as au fait with life in Great Britain as in Poland, and having one foot in both countries does allow some interesting comparisons to be made. Sometimes the comparisons are unfavourable to Poland. Have you ever tried shopping in a Polish Tesco? Sometimes the comparisons leave me smiling. I can travel right across Poland to its furthest borders for the price of a railway ticket from Stanstead to Gatwick. But at the moment I am just puzzled. I am working on a leaflet which requires a timeline, showing how the history of railways in Poland fits into the history of railways in the world. I decide that a meaningful milestone will be the construction of the last steam locomotive for PKP. (Polish State Railways). This shouldn’t be a major research project. After all everybody who knows anything about Britain’s railways knows that Evening Star was the last locomotive constructed by BR. I talk to my my friends at Fundacja Era Parowozow. I’m encouraged to look up the excellent database of surviving Polish Steam locomotives maintained by ‘Tomi’, Tomislaw Czarnecki. Reading his WWW pages always makes me depressed as every year his list gets shorter. The last locomotive to vanish was TKt48-155 which was plinthed at Kudowie Zdroj and was scrapped on 9 July 2008 at the request of the town council! Kudowa Zdroj is a pleasant health resort, but I will never stay there again. Tomi’s list can be sorted by date order which gives us… Ty2-1407 built in 1964 at the Zaklady Naprawcze Taboru Kolejowego w Poznaniu. But ZNKT was a repair workshop, not a locomotive factory, so although Ty2-1407 may have had a new PKP number, it’s unlikely to have been an entirely new build. I contact the locomotive’s current owners, the PSMK (Polish Railway Enthusiasts Association) based at their roundhouse at Skierniewice. They confirm that, although in one sense Ty2-1407’s is Poland’s youngest surviving locomotive, it was actually constructed from parts of older locomotives. I ring the National Railway Museum in Warsaw. 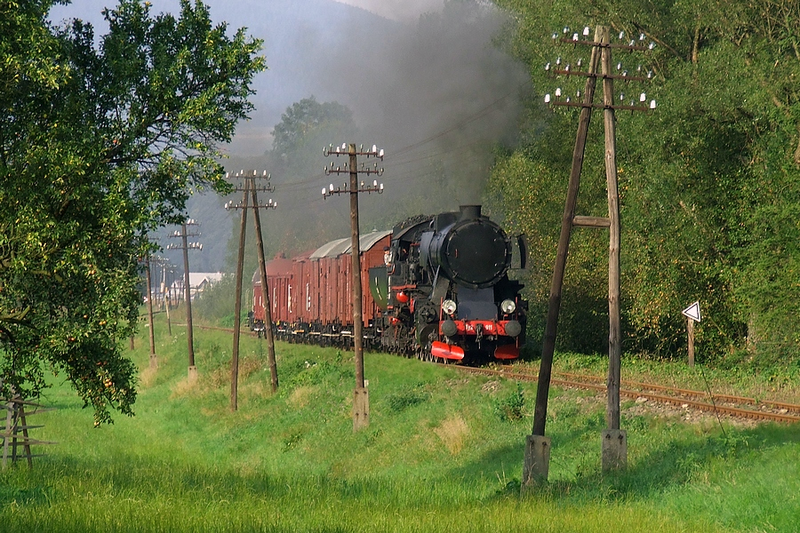 Poland’s last steam locomotive? Hold on. Wait a minute. Yes, of course! It’s our Ty51-228. There were a couple of Ty55’s constructed later, but they were experimental locomotives that never went into volume production. No I’m not sure when it was built. The information about the Ty55s was intriguing and contradicted information I had seen elsewhere, for example on M Mazurek’s private Chabowka website, that the Ty55’s never got of the drawing board. I tried Googling for Ty51-228. I am very pleased that I did so, because Google led me to Tomasz Galka’s excellent English language website, Standard-Gauge Locomotives in Poland, which I had not seen before. Galka states many of the later examples (including last five, built in 1958 with serial numbers from 2627 to 2631 and service numbers Ty51-228 to 232 went directly to industrial operators, mainly Silesian sand railways, which used 29 of them. So unless they were built out of sequence, Ty51-228 was the first not the last of this batch of 5. And anyway it was not delivered to PKP, but to some industrial railway. So it’s not the ‘Polish Evening Star‘ that I’m looking for. Galka has done a lot of research and crossed checked his sources so I was more inclined to believe him than the official PKP website (only Polish) which repeats the National Railway Museum claim that Ty51-228, built in 1958 is the last steam locomotive delivered to PKP. I decide to do a little cross checking of my own and phone Swiat Kolei, the Polish equivalent of the Railway Magazine. The editorial team at Swiat Kolei (well worth subscribing to if you are interested in Polish railways) are as always helpful and informative. There probably was no official ceremony to mark the last standard gauge steam locomotive delivered to PKP, but the event if it had taken place, would have been the delivery of a Tk51 and occurred in 1957. Several ‘broad gauge’ Tk51 were constructed in 1958. 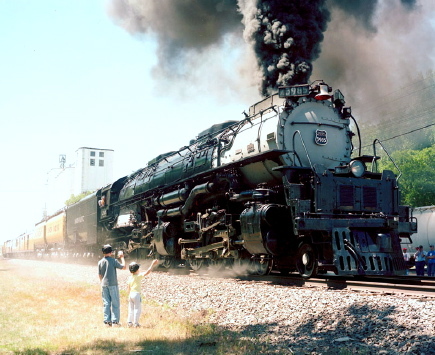 The construction of steam locomotives for export and industrial use continued into the 1960’s. A fireless steam locomotive was built in Poland as late as 1967. So there you have it. 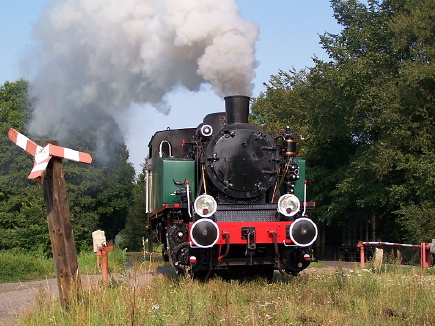 The last steam locomotive ever constructed in Poland was probably a modest fireless locomotive, and the identity of last steam locomotive ever delivered to PKP is not definitively known. The investigation has already taken far too long, and I must now ‘move on’ and continue the other work on my leaflet. If anyone out there has the time, patience and Polish language skills to continue where I have have left off, there a couple of pints waiting if they can come up with the definitive answer, backed up with solid evidence. In the meantime Wolsztyn’s magnificent Ty51-223, which was last steamed at the Wolsztyn Steam Parade in 1997, remains one of the last brand new mainline steam locomotives that were delivered directly to PKP. Mathew Murray a Manning Wardle Class “L” locomotive built in 1903, hauling two passenger coaches converted from covered goods vans on the Middleton Railway. Photo the Middleton Railway Trust. The Middleton Railway celebrated its official birthday this weekend. We had already reported its natural birthday last April, but we reckon that when a railway is 250 years old and has operated trains for every one of its 250 years, it deserves to have two birthdays, just like Queen Elizabeth! The Middleton Railway occupies a unique niche in railway history. Appearing not once, but five times, in our railway history timeline. 600 BC – The Diolkos wagonway, transported boats across the Isthmus of Corinth in Greece since around 600 BC. Wheeled vehicles pulled by men and animals ran in grooves in limestone, which provided the track element, preventing the wagons from leaving the intended route. The Diolkos was in use for over 650 years, until at least the 1st century AD. 1550s – Wagonways or tramways are thought to have developed in Germany in the 1550s to facilitate the transport of ore tubs to and from mines, utilising primitive wooden rails. Such an operation was illustrated in 1556 by Georgius Agricola. 1604 – The Wollaton Wagonway completed and recorded as running from Strelley to Wollaton near Nottingham. 1758 – The Middleton Railway becomes the first railway in the world to be granted powers by an Act of Parliament. Previously railways could only be built with the permission of the owners of the land over which they were to run. 1802 – Richard Trevithick builds one of his high pressure steam engines to drive an automatic hammer at the Pen-y-Darren iron works near Merthyr Tydfil in South Wales, he then mounted the engine on wheels and turned it into the world’s first steam locomotive. 1803 – the horse drawn Surrey Iron Railway opened – arguably, the world’s first public railway. There were no official services, anyone could bring a vehicle on the railway by paying a toll. 1804 – Richard Trevithick’s steam locomotive hauls 10 tons of iron, 5 wagons and 70 men along the Merthyr Tydfil Tramroad from Penydarren to Abercynon, a distance of 9.75 miles (16 km) in 4 hours and 5 minutes, at an average speed of nearly 5 mph (8 km/h). The weight of the engine breaks the fragile cast iron plates of the tramroad and locomotive haulage is not adopted. 1812 – John Blenkinsop, Manger of the Middleton Pits, introduces regular steam haulage to the Middleton Railway . The locomotive Salamanca, specially designed to be light enough not to break the cast iron rails, had a toothed wheel on one side to haul itself up the steep gradients with the help of a rack rail laid on one side of the track. So the Middleton Railway also becomes the worlds first rack railway! 1821 – An Act of Parliament is passed to allow the building of the Stockton and Darlington Railway. The 25-mile (40 km) railway was intended to employ horse drawn traction to connect various collieries situated near Bishop Auckland to the River Tees at Stockton, passing through Darlington on the way. Stephenson the railway company’s engineer, persuades Edward Pease, the company’s Chairman and principal financial backer to employ steam locomotives from the start. The railway is built to a gauge of 4 ft 8 ½ ins (1,435 mm) which is subsequently adopted as ‘standard gauge’ in most of the world. 1826 – The Liverpool and Manchester Railway Act is passed authorizing the construction of the world’s first modern railway, one designed from the outset to employ steam traction. 1829 – The Rainhill Trials are held by the Directors of the Liverpool and Manchester Railway. The Trails are not just to choose the best steam locomotive, but to decide wether the trains are to be hauled by steam locomotives or by stationery steam engines hauling the trains using winding drums and cables. George Stephenson’s Rocket wins hands down and the Directors of the L&MR decide to adopt locomotive haulage for all but the steepest inclines on the line. 1830 – The Liverpool and Manchester Railway is opened and the great age of railways is born. William Huskisson, MP is run over by a train and killed during the opening ceremonies, the first recorded fatal accident on a railway. 120 years of glorious railway history follow. 1950 – A committee is formed after a public meeting in the Imperial Hotel in Birmingham with the object of acquiring the 2 ft 3 in (686 mm) gauge Talyllyn Railway which had just closed. 1951 – The first train is run under the auspices of the Talyllyn Railway Preservation Society making the Talyllyn the first volunteer run preserved railway in the world. 1960 – The Middleton Railway becomes the first standard-gauge railway to be taken over and operated by volunteers. The volunteers of the Middleton Railway operated a freight service until 1983. Several hundred museum and tourist railways are saved by volunteer run societies all around the world. 2008 – The Middleton Railway completes 250 years of continuous operation, the only railway in the world to have done so. Given its truly unique place in railway history, the Middleton Railway has earned the right to have two birthdays each year! It was quite a week. Leman Brothers, the USA’s 4th largest investment bank, collapsed on Monday creating the largest bankruptcy in American history. Lloyds TSB acquired HBOS, leapfrogging over competition rules, and acquiring the blue riband for fastest financial institution takeover in recent British history. Bank of America swallowed up its smaller rival Merrill Lynch, and AIG, an insurance company that insured the value of certain derivative stocks, received a USA government bailout of $85bn. Now we realise that you can read this sort of stuff every day in the mainstream media and that some of our readers may only read BTWT for relaxation and enjoyment. If you are one of these and wish to escape from screaming headlines proclaiming global economic collapse, help is at hand, simply follow the instructions immediately below. Go to ‘A watery palimpsest’. If you are still here, I’ll take it that it will be OK with you to explore briefly some of the underlying issues of the current crisis before this article returns to matters directly related to transport. If you are heavily involved in one political party or another – fear not – BTWT is totally non-party political. As a schoolboy, I concluded that party politics is like baseball or football, while the crowds go mad screaming their support for one team or the other the really important action is going on off the field. And the guys with the cash are happy to sponsor first one team and then another. I’m even willing to accept that most politicians are well meaning. I knew two members of the current Polish cabinet when they were young men and they were both chaps that you would have been happy for your sister to out with. Individual politicians are caught up in huge currents that are entirely outside their own control. You can’t reach the highest levels of power in a modern parliamentary democracy without one or two wealthy patrons or sponsorship by one interest group or another. Such support comes at a price. So you would not expect mainstream politicians of whatever party, Democrat or Republican, Conservative or Labour, to differ much from each other on fundamentals. Britain’s failure since WW II to move away from a road dominated transport policy and Ruth Kelly’s blind instance to proceed with the third runway at Heathrow is a symptom of the power wielded the road and oil lobbies and other vested interests over UK politicians. The current crisis in the financial services markets is part of a game being played by ‘powers of which we have no knowledge’ for much higher stakes. More directly it is result of the laissez faire approach to financial regulation introduced (but not designed by!) Ronald Regan and Margaret Thatcher, and then supported by all subsequent American presidents and British prime ministers! These policies allowed a select few to make huge fortunes, but everybody else, whose savings and pensions are now evaporating, is paying the price. The best analysis of the current crisis that I have been able to find is this interview by Charlie Rose with George Soros, the man who bet against the Bank of England and won! An alternative analysis, which is well worth reading, appears in the Financial Times here. Finally, for a transatlantic view, have a look at this article in the New York Times. As I am also affected by the current situation, I’ve been doing a lot of background reading to research alternative options. On my reading list is The Economist. On Saturday, I was amazed to discover, at a time when I thought that the periodical would be full of articles about other matters, this charming article about Britain’s canals. Today, thanks mainly to gongoozlers’ passion, 2,000 miles or so survive; the rest have been paved over or filled in. With industrial traffic gone, they have been transformed to avenues of leisure and houseboats. Thousands of narrowboats ply the waterways (at around four miles-per-hour), traversing a lock system unchanged since the Victorian age. Pausing alongside a busy lock on a Sunday stroll and watching the boats line up, enter the hatch, open the sluices and ascend or descend, evokes a dynamic sense of past, sustained into the present. The Economist piece (click here to read the full article on the Economist website) paints a delightful picture of the recreational value of the navigable British rivers and canals. But it’s strange and disturbing that the transport value of the waterway system is so rapidly dismissed. Visionary pointy-heads occasionally tout the canal as the answer to freight congestion on British roads. Such possibilities exist (in the shifting of waste, for example) but these are typically over-egged. A 2,000-mile network that relies on narrowboats travelling at four miles per hour, will never seriously challenge the motorways. I remember the last commercial carrying by narrow boats on the Grand Union in the 1960s. What killed the trade was not economics, but the failure of British Waterways to dredge the canal system to sufficient depth and the prolonged closure of Blisworth tunnel for major rebuilding in the 1980s. With fuel prices an order of magnitude higher since those days it would seem a no brainer to promote the carrying of bulk, non-perishable goods, on Britain’s canals. A pilot scheme is already in operation carrying gravel from a pit near Denham to Hanson’s gravel terminal in West Drayton. Sadly British Waterways still seems more interested in turning over its wharves to property developers than promoting its waterways network as an alternative transport network. 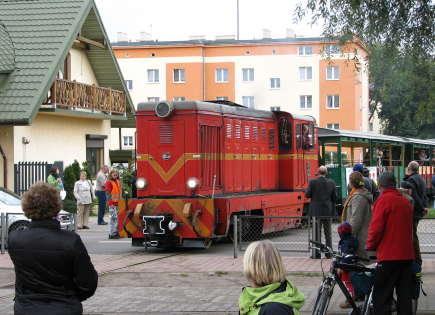 The Krosniewice Railawy came briefly to life this weekend during a festival at Leczyca thanks to the lobbying of SKOKW (The Krosniewice-Ozorkow Narrow Gauge Railway Society) . An intensive shuttle service bewteen Leczyca and Ozorkow was operated on both days. The two day festival would not have been possible without the enthusiasm of the Mayor of Leczyca, Andrzej Olszewski. 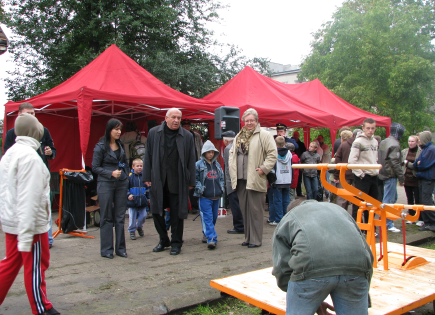 Mrs Barbara Herman, the Mayor of Krosniewice, agreed to the ‘reopening’ of the railway for the two days of the festival. On Sunday afternoon she graced the proceedings in order to establish her bona fides as a supporter of the railway. Unfortunately none of the media present asked the obvious question – if she supports the railway, why did she close it? Mrs Herman’s predecesor as Mayor had obtained a licence from PKP (Polish State Railways) for Krosniewice Council to manage the railway, granted an operating licence to SKPL and was in the process of acquiring the freehold to the railway land. But Mrs Herman had other plans and she closed the railway in March 2008. A month earlier she had given notice to SKPL, the railway’s operator, that their operating agreement was to be terminated. Since then she has made no moves to appoint another operator. Krosniewice Town Council’s agreement with PKP was subject to a condition that the railway would be used for transport purposes. Mrs Herman regards this condition too restrictive and recently met with representatives of councils through whose land the railway runs to press the case for her own plan whereby each local authority along the line would takes over their local section of railway land from PKP without any transport condition being imposed. The danger of this plan is that it gives each local council a free hand as to what they might eventually do with the railway land. (Mrs Herman has friends who want to redevelop the railway station and workshop site at Krosniewice.) We already know that other local councils at the northern end of the line are more interested in building a cycle path than owning and running a railway. Is this to be the sad future of the Kujawy Railways? The banner says “The Ozorkow-Leczyca-Krosniewice Narrow Gauge Railway”. The Krosniewice Railway is a 110 km fragment of the former Kujawy Railway Network which in its heyday comprised some 2,000 kilometres of narrow gauge lines of both 750 mm and 600 mm gauge. The network comprised a core network of PKP operated common carrier railways and many hundreds of kilometres of private sugar beet railways. When PKP closed the network in 2001, the Kujawy Railway was split up into three sections based on Gniezno, Sompolno and Krosniewice. Whereas railway enthusiasts were successful in persuading local councils in Gniezno and Krosniewice to take over their sections of line, they were less successful with the central section at Sompolno. The well equipped railway workshops were gutted by scrap thieves and this once important railway junction now resembles a wilderness. 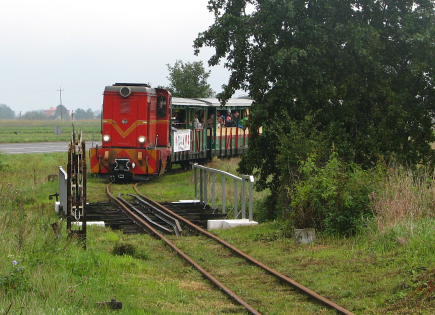 The Gniezno section is beong operated purely as a tourist line. Meanwhile SKPL, with its regular service which linked the sugar refinery at Breszcz Kujawski to the PKP network, maintained the Krosniewice Railway as Poland’s last narrow gauge rail servicing the sugar beet industry. When Mrs Herman was elected Mayor, she immediately started making difficulties for SKPL demanding that the society hand over monies for rents which her predecessor had prevented it from collecting. She then demanded that SKPL vacate the railway workshops and when the society objected she terminated their operating agreement. From our own moles in PKP we know that Mrs Herman has threatened that if she does not gain control of the railway land she wants for redevelopment she will let the whole railway “go to the dogs”. 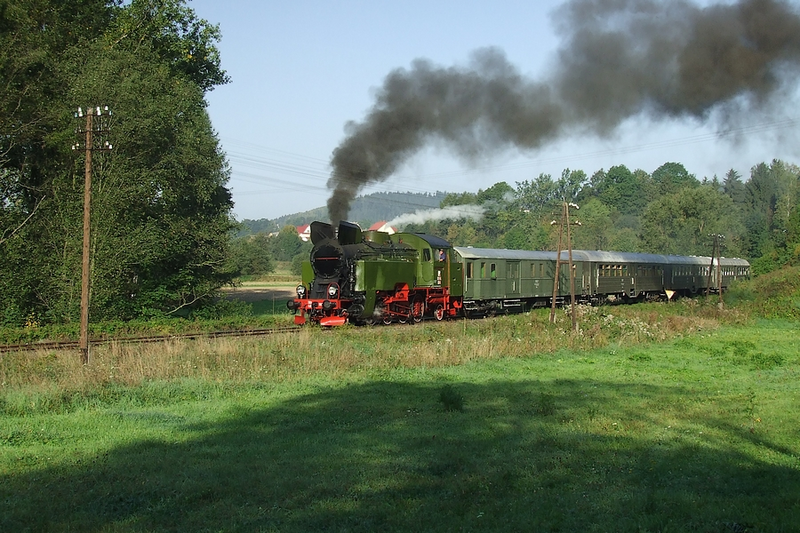 During the festival Pawel Papierz, SKOKW chairman, said that this year there had only been one weekend of operation on the Krosniewice – Ozorkow branch, but that next year there would be trains every weekend during the operating season. It was significant that the line’s ‘owner’ Mrs Herman made no such promise, nor has her council entered into any agreement with SKOKW or any other potential operator. These trams were snapped just before noon yesterday. Most of the shots were taken at or near the tram stop opposite Warsaw’s main railway station, Warszawa Centralna. advertiser’s livery) head down ul. Chalubinskiego. The first 13N prototype was delivered from Konstal’s Chorzow Works to Warsaw in September 1959. A further 837 were delivered to the city during the next ten years. Their first passengers nicknamed them trumny, because of their coffin shape and their habit of trapping passengers when they broke down. They were a direct replacement for the two axle trams that had served Warsaw through two World Wars. The rounded ends were to suggest high speed and modernity, and they did succeed in speeding up services on Warsaw’s uncluttered roads in the 60’s. The public never took to them in the way they had regarded with affection the 4 wheelers that they replaced. Partly because it was a steep climb to get inside. They had high floors were to give adequate clearance between their framing and the power bogies. In the 60s trams were intended to get the fit and able bodied to the factories. If you were elderly or disabled you weren’t fit for work and you were supposed to stay at home. Two 105N sets wait for the tram stop to clear. The 105Ns were introduced in October 1975 and, with various variants, the design remained in production until the 1990s. Curves were no longer fashionable. They had extremely high floors to accommodate a main girder that ran down the middle of the tram above the bogies. Curves are back in fashion. 122 105N2ks were built by Alstom Konstal for Warsaw in the period 1995 to 2001. Power supply is thyristor controlled. Electronic indicator boards announce the next stop. But the floor is 890 mm above rail height! In July 2007, the first of 15 PESA 120N low-floor articulated trams arrived in Warsaw. A metre gauge variant (the 122N) has also been supplied to the so called ‘Lodz Regional Tramway’. The 5 segment articulated trams give a good quality ride, although it’s not as smooth as that offered by air suspension trams operating elsewhere in Europe. The low floor (and slightly increased platform heights) do facilitate access for those in wheelchairs, but the 6 inch horizontal gap and 9 inch vertical gap cannot easily be traversed without assistance. The assumption still seems to be that if you are disabled you stay at home. If you do venture out further afield you go with a ‘minder’. I thought that the EU had Directives about equal access to buildings and transportation! 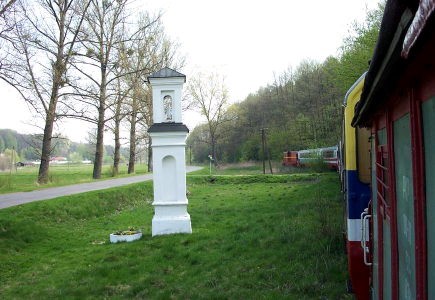 Roadside miniature ‘chapels’ are very common in Poland. Not long ago we reported that the future looked grim for the Naleczow Railway. Now comes news that the PKP Estates Company has completed the formalities of transferring the railway land to the local authority and that the latter in turn is preparing an EU-funded programme to revive the railway. Watch this space! 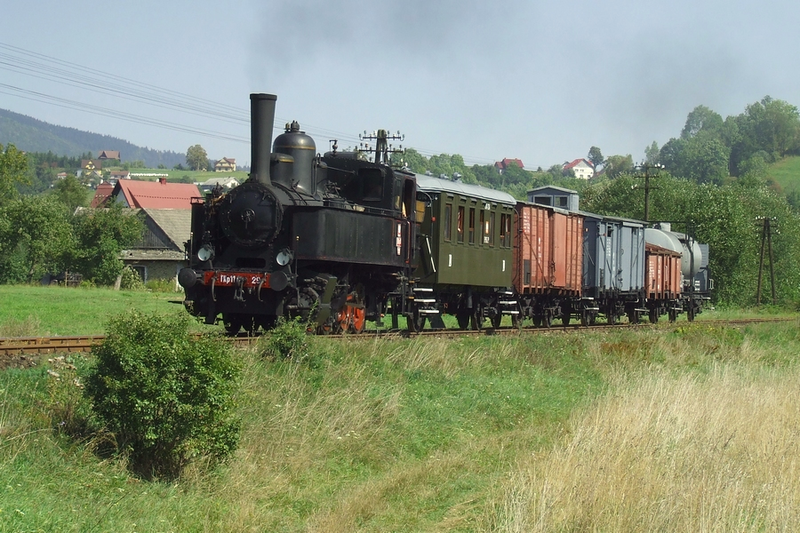 The Chabowka-Nowy Sacz railway line is a fragment of the Linia Tranwersalna, an East-West railway route built by Austrian engineers across the South Poland, in the foothills of the Carpathian mountains. 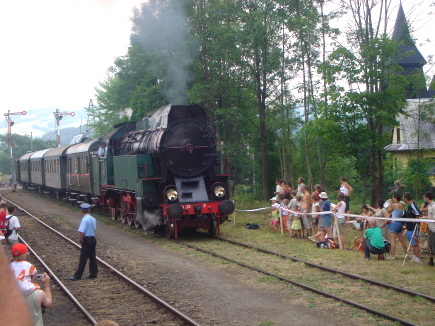 Normally closed to all traffic, the line comes alive for a few weekends each summer as it is used by steam specials hauled by locomotives based at PKP Cargo’s railway museum in Chabowka. These photographs showing vintage trains running on the line are all the work of Michal Affeltowicz. They were all taken on Sunday 6 September and show the three 110 zloty photostop specials that were part of this year’s Chabowka Steam Gala. Our thanks to Michal for letting us see the above. Michal’s pictures of the 2006 Chabowka Steam Gala can be seen here. A fuller report on this year’s Parowozjazda will appear in due course. If one was superstitiously minded, one might think the BTWT editorial team clairvoyant. On Thursday 4 September, we announced that our services would be temporarily suspended and we carried an illustration of a train stopped by water on the track. A week later, Eurostar announced that the UK’s most famous train service, which normally goes under water, is suspended by a fire in a lorry on the Euroshuttle freight service. Of course, this is only a coincidence. For 130 years, from 1856 to 1986, the idea of a railway link under the channel was promoted. It met with official hostility and indifference. There were actually two attempts to build the tunnel in 1881 and 1974. The 1881 attempt was linked to Sir Edward Watkin’s plan for a high speed railway route from Manchester to the continent. The 1974 attempt was a government funded project which was still primarily a link between the railways of Britain and France. BTWT is apolitical and does not care a toss about party politics. However, we do not hesitate to name politicians who play an important role in shaping transport policy. When the idea of building the Channel Tunnel was revived again in 1981, it was Mrs Thatcher who insisted that it’s main purpose was to be a shuttle for road vehicles. The extra size of the tunnel’s main bores, to accommodate road lorries carried on special rail vehicles, added considerable to the project’s cost and complexity. While the tunnel itself received no public funds, two massive motorways, the M20 and M2, were cut through the South Downs to funnel road traffic to the tunnel’s shuttle terminals. These political decisions left Eurotunnel with a large bank debt and a preference for running its own shuttle services for lorries rather than providing paths for freight trains. An Anglo-French safety commission only allows a limited number of certified railway vehicles to run through the tunnel. The result of all of these constraints, and the withdrawal of UK-French government subsidies, is that the Channel Tunnel’s full potential to carry rail freight has never been realised, and that only a handful of freight trains work through the tunnel. The total cost of yesterday’s fire in the Channel Tunnel will run into hundreds of millions of pounds. It’s ironic that the three fires that closed the Channel Tunnel (on 18 November 1996, 21 August 2006 and 11 September 2008) all took place in road vehicles, or more specifically the HGV lorries, whose carriage by the tunnel shuttle Mrs T had insisted upon. It’s also unfortunate that Eurostar, the high speed train operator between England and France that has been doing so well, will be taking a hit from a disaster on an operation – the Eurotunnel Shuttle – over which it has no control or influence. I’ve spent the last seven days traveling some 1,500 km around Poland with a party of Englishmen looking at the best railway and industrial heritage attractions in Poland’s industrial heartland. The week left me convinced that Poland’s authorities haven’t a clue as to what makes Poland special for overseas visitors or how to use this to promote Poland as a tourist destination. Highlight’s of the trip included a tram trip to Nowa Huta, Cracow’s Stalinist steelworks suburb, seeing the enormous stationary steam engine working at the Krolowa Luiza coal mine in Zabrze, attending the two day steam gala in Chabowka and Sucha Beskidzka, and driving a steam engine on the Smigiel narrow gauge railway. Detailed reports on many of the places that we visited will be posted in due course. In the meantime the overwhelming impression is of unique attractions which receive little official promotion outside Poland and whose long term fate is far from the secure. Fri July 2007. Tracks flooded at Cheltenham station. are reappraising a scene from The Railway Children. The Behind The Water Tower editorial team is taking a break. Not for us, sundrenched beaches and palm fringed sands. We’re off to Parowozjazda and then will be going on a short industrial heritage safari around the industrial heartland of Silesia. Suitably refreshed, after breathing lots of smoke and steam, we’ll be sharing our impressions with you on our return. In the meantime, what to do when you need that daily BTWT fix? Well you could read the BTWT archives. BTWT started is new life on wordpress.com exactly six months ago. There are 210 posts which can be searched direct, or with the help of 109 categories and 599 tags. Once you have read all the posts, there are also 145 comments. We don’t agree with all of them, by any means, but they are all worth reading and thinking about. See you again on 12 September. If you want an e-mail reminder sent to you that we are back, send an e-mail to us at: railfan(at)go2.pl. The (at) needs to be replaced with an ampersand. As predicted in our post last Thursday, the two sections of WHR track – the section laid northwards from Porthmadog and the section laid eastwards from Carnarfon via Beddgelert – met up this weekend. A gold coloured pandrol clip was hammered in without much ceremony and that was that. The rails have been laid so that they pass each other. They lie tantalisingly close to each other, but do not connect. 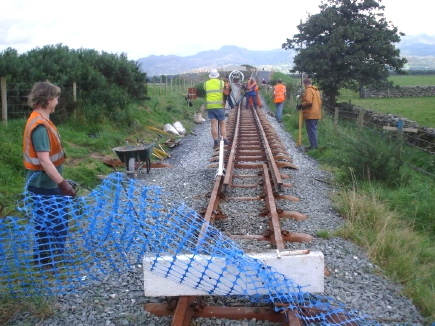 Although signalling and other safety systems remain to be installed, some suspect that the real reason for this arrangement, is that progress made by the WHR track gang somewhat overtook the progress being made by the two Welsh Highland Railway companies on a detailed running rights agreement to govern interworking between the two. Only a couple of hours work remains to make the connection, however, trains operated by WHR (P), the successors of the original WHR society set up in 1964, won’t be running to Pont Croesor just yet. There are even rumours that they won’t be running there in 2009! All discussion on the topic has been banned on the two WHR discussion groups! Meanwhile work by contractors in Porthmadog to connect the Ffestiniog Railway to the WHR continues, and a physical connection between the two is expected to be in place is within the next two months. The following information has been published in Polish by Milosz P. Mazurek of PKP Cargo on the PAROWOZY z WOLSZTYNA discussion group in the Parowozjada 2008-program imprezy thread. Behind The Water Tower cannot accept any responsibility for the accuracy of this programme or for any changes that the organisers may make. The Saturday steam specials are intended to help the general public reach Sucha Beskidzka and Chabowka, and are very reasonably priced. Trains 1 is only 12 zl each (24 zl return). Train 3 is 13 zl. Train 2 is 5 zl (10zl return) and train 4 4 zl (8zl return). The tickets may be bought on the train and prior reservation is not necessary. The Sunday steam specials are targeted at the railway enthusiast market, special facilities such as photostops are provided, and the trains are priced accordingly. PKP Cargo has issued a notice that the places on Sunday’s photostop trains are sold out and no more carnets are being sold. All in all, this looks to be the best Parowozjazda yet. Our only gripe, and it is a major one, is that once again PKP Cargo make their arrangements at the last possible moment and the detailed programme is published literally days before the event.